Postcron is a social media management tool that enables users to schedule posts on all leading social media platforms. These include Instagram, Facebook, Twitter, LinkedIn, and Pinterest. The tool then automatically posts the content at the stipulated date and time, all from a consolidated dashboard. Users can also save a lot of valuable time with the bulk upload feature that can post up to 1000 posts or tweets from an Excel file. Postcron can even safeguard the images against piracy by automatically adding watermarks to images and all posts. 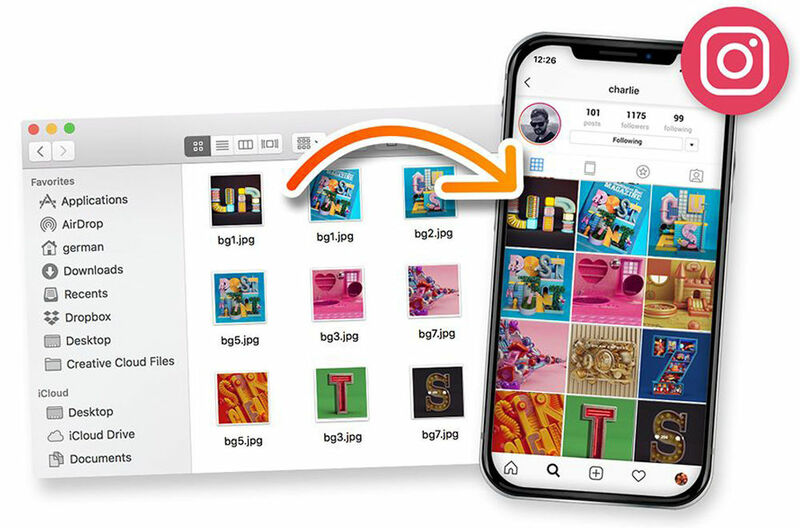 The tool places special attention on Instagram and allows posting on feeds or stories without notifications or reminders. This includes posting multiple simultaneous images via the carousel along with adding location to the posts. How much does Postcron cost ? The pricing for Postcron starts at $8.0 per month. 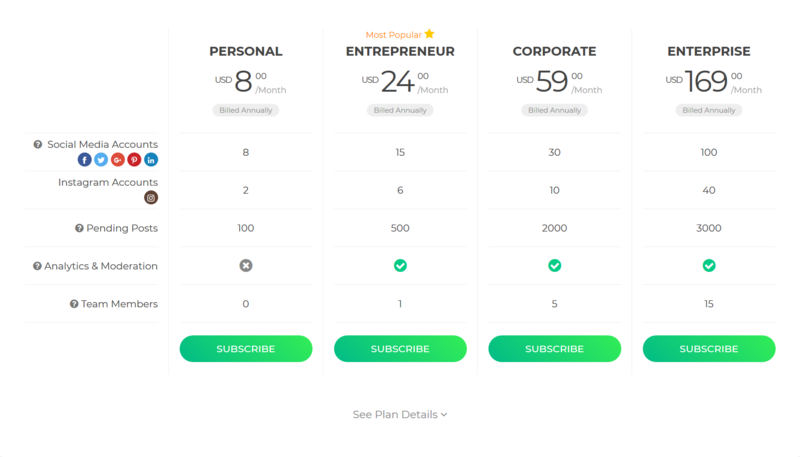 Postcron has 4 different plans such as - Personal at $8.0 per month, Entrepreneur at $24.0 per month, Corporate at $59.0 per month and Enterprise at $169.0 per month. Disclaimer: The pricing details were last updated on 30/10/2018 from the vendor website and may be different from actual. Please confirm with the vendor website before purchasing. Pros: Postcron is great for posting simultaneously to Facebook/Twitter, etc. It allows you to link up to five accounts and schedule ten posts with their free plan, and the ability to upgrade to the business plan for greater capacity. Probably the easiest scheduling app I've found. Cons: There is a limit to the file upload size for images, and sometimes the thumbnail images from website links and/or link previews do not post as expected. Overall: Postcron has been great for saving time with simultaneously posting, and allows us to schedule posts in advance on Twitter. Pros: I've used Postcron off and on for years, whenever one of my other social sharing apps disappointed me or removed features from early adopters (looking at you dlvr.it) and for the most part, it's done the job, reliably grabbing images from posts when other apps didn't. Instagram is now supported, so that's a plus, and not with the wonky workarounds some other apps require. Bulking uploading of post is a real time saver but not an important feature for small businesses and hobbyists. Postcron allows more social media account in the free plan than other apps do. The recommendation engine isn't bad but by no means best in class. Cons: Chrome extension hasn't been updated since 2017 and is broken. I don't have the patience to use the web interface for only a handful of posts and I imagine this is a deal breaker for many pros. There are frequent errors in posting which clicking the retry button does not resolve. Overall: A couple years ago I would have recommended social media marketers and hobbyists who need to schedule posts and social-share quickly to take a look at Postcron. Now, there are better solutions. For me, SEMRush Poster is at the top in this field, followed by the venerable Buffer. I can't think of any advantage that Postcron has over those two. Pros: Fairly easy to schedule posts, and lots of resources to learn about their features. Had some useful updates over the years. Cons: Repurposing/reposting could be made easier. Sometimes had trouble with images during bulk uploads. "Best and simple scheduling tool"
Postcron is super simple to use, and has fully Instagram support: I can schedule Stories, with questions, sliders, polls, locations, mentions, hashtags, etc. Also I can design my own images or videos for free to publish on Instagram with Artstudio. If you want to schedule and manage your social networks, Postcron will be a great option. And if you want to use Instagram, it will be the best, with the new features to post Stories with reach content, you will love it.
" A little slow, but respond." They took the initiative to reach the solution. The solution was slow to be taken care of by the company, however, they finally responded. Pros: This used to save me time as I was managing several social media accounts. You can add images, hashtags and schedule them so you can have some peace of mind that your social channels are active while you're away. Cons: I've always had UX problems with this software and I don't believe it's the best you can get. As for customer support, they did absolutely nothing to help me and just left me on "seen" when I asked if they could follow up. Still trying to get them to close an old account I no longer have access to since the company closed down months ago, they're keen on continuing to charge me for the plan. Overall: Saves time when managing several social media accounts. "Postcron is an excellent social media manager "
Postcron is very easy to use. You can make changes very easily, you can duplicate posts quickly and I like that Postcron shortens the urls automatically and pulls the picture through from the article. The cost is expensive. The bulk uploader did not work for me and pulled through odd symbols from the CSV file. It is also difficult to add facebook accounts. Yes it is great. It is expensive but is very easy to use. I do not like the bulk uploader feature. I only have to log into one account to see all my clients social media profiles. This saves me time. My clients also have full control over their own social media as they can create their own free account and make any changes and updates. Using Postcron saves me so much time in scheduling client social media on a number of platforms. I dislike social media, but Postcron helps me deal with it simply. Streamlining time spent on social media. "An easy tool for Social Media professionals "
It's easy to use and it works properly. Sometimes, it doesn't save the post we write and it takes time to rewrite again. You can not do mentions in Facebook. Also, sometimes it doesn't work as well as it should with Safari, and Mac is the most use technology for the people that work in this area, so I think it can be improve it. It's easy, it's not expensive and has all the things that you need to schedule post in your social media pages. Postcron it's a necessary tool for everybody that works with different profiles in Social Media. We all need to scheduled the posts.